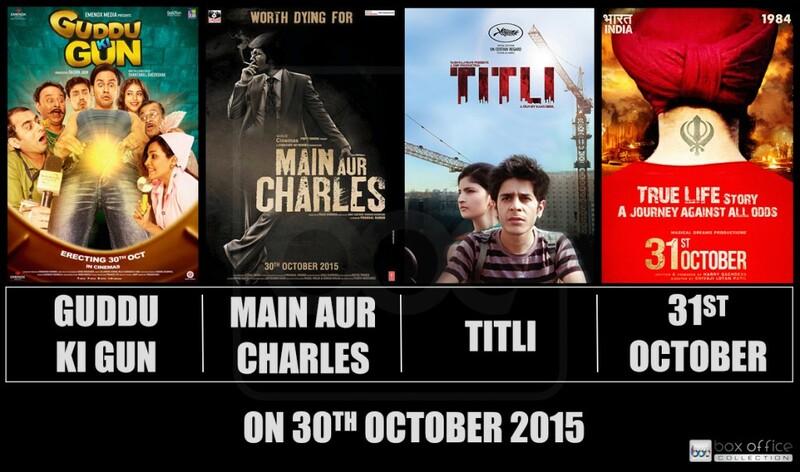 This week audience will not have any strong option to watch but some good non-commercial movies are in the list to be released on 30th October 2015. 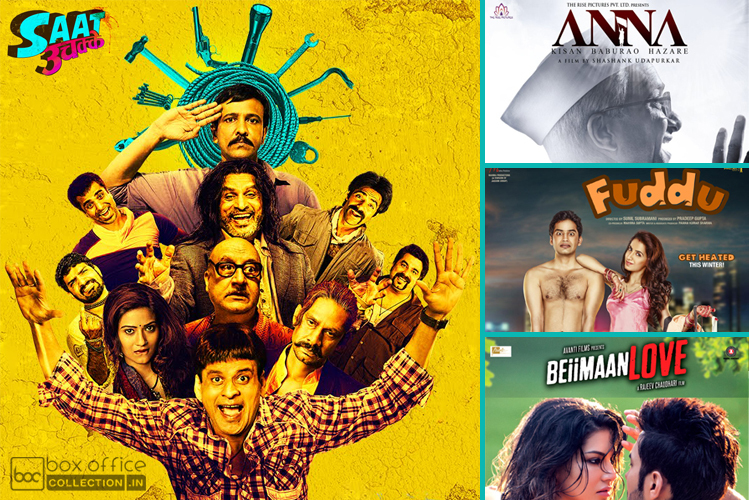 There are more than four movies from Bollywood are releasing, out of which only four- Guddu Ki Gun, Main Aur Charles, Titli & 31st October have little bit hype among audience. But trade analysts do not have any positive hopes with these movies. ‘Guddu Ki Gun’ is an Adult Comedy Hindi movie, directed by duo Shantanu Ray Chhibber – Sheershak Anana & produced under the banner of Emenox Media Pvt. Ltd. It features Kunal Khemu in lead role, along with debutante Payel Sarkar & Aparna Sharma in supporting characters. 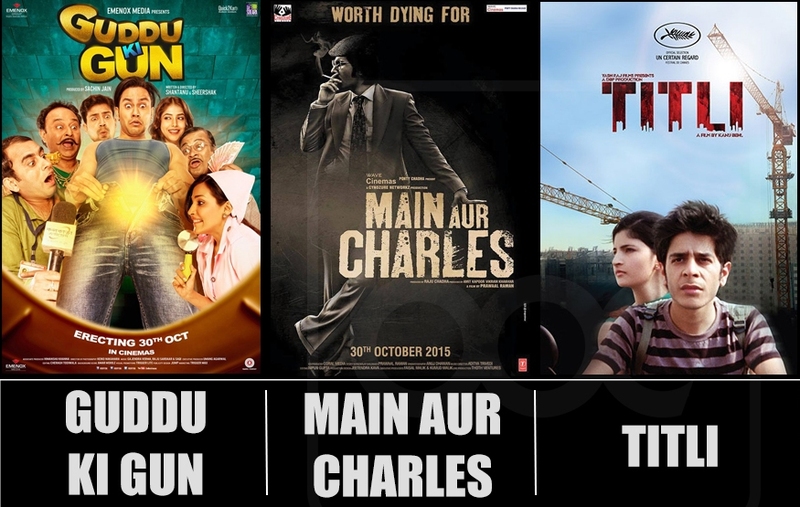 ‘Main Aur Charles’ is an Indian drama movie, directed by Prawaal Raman and jointly produced by Raju Chadha, Amir Kapoor & Vikram Khakhar under the banner of Cynozure Networkz. The movie is based on a true events, features Randeep Hooda, Richa Chadda, Adil Hussain & Tisca Chopra in lead roles. ‘Titli’ is another Bollywood drama movie, directed by Kanu behl and produced by Aditya Chopra & Dibakar Banerjee under the banner of Dibakar Banerjee Productions Pvt. Ltd. & Yash Raj Films. It features Ranvir Shorey, Amit Sial, Shashank Arora, Lalit Behl & Shivani Raghuvanshi in the lead roles. ’31st October’ is an forthcoming Bollywood movie, directed by Shivaji Lotan Patil & produced by Harry Sachdeva. The movie is based on a true story & features Vir Das and Soha Ali Khan in lead roles. It has already premiered at London Indian Film Festival in July & received huge appreciation from audience. You may find more options in theaters, we have included only confirmed releases.